BLOOMINGTON, Ind. 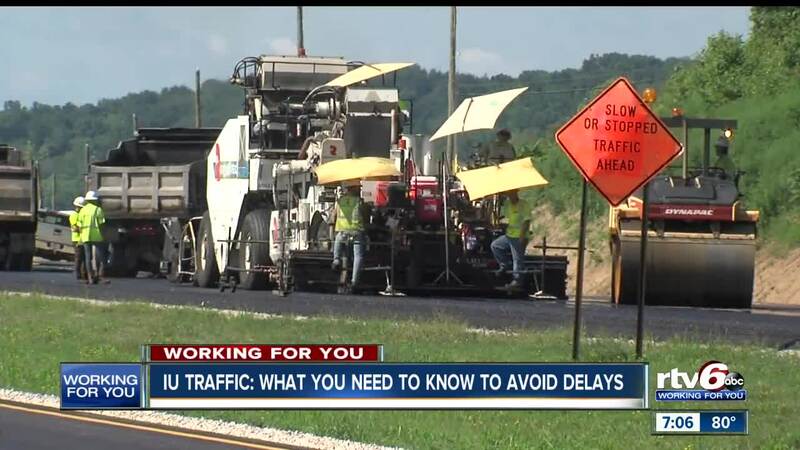 -- School is almost back in session and football season is right around the corner, but a lot of road construction heading down to Bloomington might cause a delay in your travels. It’s all part INDOT’s major project that has been underway on I-69 Section 5 (or State Road 37) for a couple of years. "A lot of paving going on down there, so we have to protect the workers, protect the paving crew,” said Andy Dietrick, INDOT’s Public Affairs Manager for Section 5. To keep those workers safe, I-69 is reduced to one lane coming out of Martinsville, heading south to Sample Road. Pair this one-lane configuration with the influx of students heading to school, and traffic can get heavy. So, Dietrick said INDOT is recommending that drivers find an alternate route. “State Road 67 and coming down to State Road 46 and bringing that in. Or I-65 to State Road 46 and bring that into Bloomington,” said Dietrick, of some of the alternate route options. But, sneaky backroad drivers, you might want to listen up. This new configuration might change your typical route to Bloomington. “This is a limited-access highway. Which means that a lot of the roads that used to connect to State Road 37, that people have become accustomed to, no longer connect. So, if you're thinking of avoiding congestion by going on the back roads, especially on the east side, those connection points aren't there anymore,” said Dietrick. To turn around on the interstate, since it’s a limited access highway, you will need to go to the Liberty Church Road interchange just to the south of Martinsville, or the Sample Road interchange, which is heading toward Bloomington. But the good news is, once you reach a certain spot, your travels will be a lot less messy. "South of State Road 46, where most of the activity for students and parents is, it's looking in pretty good shape," said Dietrick. Dietrick did want to add that there is some work going on at the exit typically used for IU football games, which is the exit around State Road 46. “A complete rebuild of the interchange. A lot of work reconstructing the approach ramps, doing some work on all of the ramps. Doing some bridge work. It was work that was scheduled for a few years out, but while we’re there, we’re going to take care of it,” said Dietrick. He also said INDOT is working closely with IU to phase this project in a way that won’t disrupt traffic too badly. As for the project completion date as a whole, the hope is for it to wrap up by the end of August. Again, weather permitting. “It’s a date that we’re hoping that the entire construction zone will begin to look a lot more like an interstate highway. Traffic unrestricted on the mainline, the roadway is open. It won’t be pretty, but it will be more functional than it has been for the last couple of years,” said Dietrick.